To help the hopefuls waiting for the APSC Assistant Engineer Admit Card 2019, we had provided the complete details on this page. Also, candidates can get their Assam PSC AE Hall Ticket 2019 from the Official Link given at the bottom of the page. The Assam Public Service Commission (APSC) is going to release it in the month of February 2019. Also, APSC Assistant Engineer Exam Date will be in February 2019. With this in mind, the applicants should prepare well for the Exam. Moreover, Assam PSC AE Selection Process is also given in the below section. By referring that you will get a clear idea regarding the procedure of selection for the post of Assistant Engineer. Accordingly, the selected candidate will be placed in the state of Assam. So, candidates should prepare well for the AE Written Examination. Also, you people can refer the previous papers and test papers from our webportal. Furthermore, all the details regarding the Assam PSC AE Selection Process and APSC Assistant Engineer Exam Date are furnished in the upcoming sections. In this section, you can have the information on the selection procedure. Hopefuls willing to secure Assistant Engineer Job in Assam should know the Selection Process first. Mainly, APSC conducts the process in 3 rounds every year. Also, there are 3 rounds this year for 65 Assistant Engineer Posts. As mentioned above, the APSC Assistant Engineer Exam Date is in the month of February 2019. Before attempting the Exam, one should check whether they have any one of the below given ID Proofs with them or not. If not, you need to apply for it immediately. Because, without that, the officials may not allow to the Examination Hall. So, carry any one of them for the Exam for verification purpose. 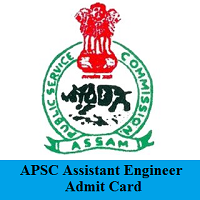 First, Candidates willing to attend the Written Examination should download the APSC Assistant Engineer Admit Card/ Assam PSC AE Hall Ticket 2019 form the Official website. After getting the Admit card, you need to check whether the details present on that are correct or not. And if any mismatch occurs, you should notify to the Higher Authorities of Assam Public Service Commission and ask for the modifications. Refer below given fields, so that you will get an idea. First, visit the webportal of the Assam Public Service Commission (APSC) i.e apsc.nic.in. Then, you need to check for the APSC Assistant Engineer Admit Card 2019 and click on the link you saw. Next, you will find APSC Assistant Engineer Admit Card with your Name. Hence, think you were happy with the information provided like Assam PSC AE Admit Card, APSC Selection Process, Exam date etc., For any doubts and wanted information, you can happily ask us by leaving a comment in the below section. Thank you for staying with us and don’t forget to bookmark FreshersNow.